This situation, where each country fends for itself and Europe is only for celebrations will not work, said to me on Friday afternoon Daniel Mondekar, Chairman of the European Affairs Committee in the Croatian Parliament. He is a member of the Social Democratic Party, which is part of the ruling “Kukuriku” coalition. He has a Masters degree in History. I find him in between several important votes in the Sabor (Croatian Parliament) before it is dissolved, due to the regular parliamentary elections, and the emergency address by Prime Minister Zoran Milanović on the refugee crisis. He shares the government’s opinion that the situation is not dramatic, but is serious. At the time of our conversation in the Croatian Parliament, a little over 14 000 refugees had entered Croatia and by Monday morning their numbers are up to 29 000. Mr Mondekar explained that the problem is not that the state did not expect such large numbers. On the contrary, he says, there were expectations of at least 20 000 over a few days. The problem is it was not expected that all of these will enter within 24 hours. He says that from the very beginning, and this is the Arab Spring and the conflicts in the Middle East, the EU had the wrong strategy. In the Middle East the Union behaved quite patronisingly. On the other hand, it looks like the EU totally forgot what war is, and that it was created as a peace process. The reason is that all European wars are far behind the EU’s back and thus it dedicated itself to trade, growth, battling the crisis. That is the reason why the Union did not deal in the best possible way with the Ukraine crisis. There are problems in North Africa. They are especially serious in Syria. EU’s solidarity is put to a great test, he thinks. Some European states are revealing themselves to be not very keen on solidarity. Germany’s example with the decision to shelter 800 000 people is very welcome, however many member states have less solidarity. This leads to a situation where countries like Croatia turn into gathering points for refugees, who are expected to stay here, for they will be unable to go away for a long time. 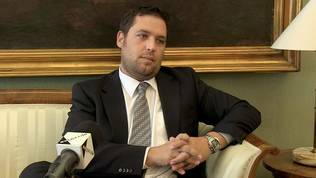 Just like PM Milanović, Daniel Mondekar raised the question why Greece does not abide by the rules. This can continue no longer, he added and expressed expectation that certain decisions will be made at the summit on Wednesday. He thinks statements, coming from Hungary about cultural balance and protecting Christianity are unchecked words. European culture exists, so does European tradition, but also a turbulent history which shows we need to show solidarity. Daniel Mondekar reminded how old Yugoslavia opened its borders and helped when the Russian tanks entered Budapest. “So this is not about culture, or religion, it is simply about helping people, many of whom – women and children – are fleeing war-devastated Syria. Building fences is in no way a solution. Solidarity of all 28 members is a solution”, he concluded. And is the refugees issue really within the coordinate system of the political left and right? Daniel Mondekar admits that there is politics in this subject but reminds that, on one side, there is the right-wing Hungary, who is backing a “really poor solution to the problem”, and on the other side is right-wing Germany, which invites 800 000 people. He also reminds that the EPP, which is a right-wing party, is of the opinion that there is a need for humanitarian corridors. The paradox is, he points out, that some EPP members do not agree with the common position. It is a fact that the subject is being politicised and it breeds a lot of political intriguing, “but this remains a question of humanity and solidarity”. Will the refugee crisis affect relations with the Western Balkans? The situation with the Western Balkans is also quite complicated, says Daniel Mondekar. On the one hand you cannot just turn and tell these countries “If you want to join the EU, now is the time to show solidarity and prove yourselves to be Western Europe” with no aid whatsoever. On the other hand, these countries need to show they can function as member states. An end must be put to the rhetoric that cheap labour from the East can substitute workers from the Western Balkans. The states that wish to become members of the EU need to conform to the rules of free movement of people, said the Chairman of the European Affairs Committee in the Croatian Sabor, Daniel Mondekar.